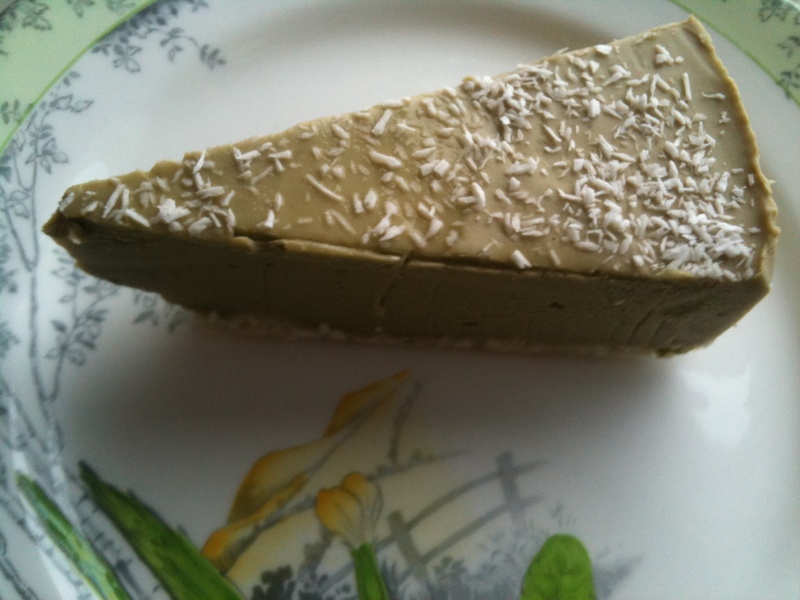 The other day I popped into Planet Organic for some supplies and being peckish as usual, I couldn’t help but grab a ‘healthy treat’; a ‘visionary raw key lime pie’ from the range created by Inspiral Cafe, a vegan restaurant in the thick of Camden, London. Well!! This was more than a treat it was a decadent, lustful, slobbering one way ticket to happiness and best of all – it was 100% raw, full of nutrients and therefore packed with only natural highs. The ingredients list is simple; avocado, lime zest and juice, cold pressed coconut butter, raw agave nectar, dessicated coconut, raw cashew nuts, vanilla extract, and fresh ginger. It’s raw, dairy free, gluten free, soya free, low gi, vegan, organic, eco packaged and could quite possibly increase your spiritual awareness. I’m so excited to see more raw food brands popping up that do such a great job at turning the perception that raw food has to taste like sawdust. Try it – you wont believe your luck! Having decided to make guacamole for dinner, I started with Google. With 512,000 results, I realised I had to refine my search, so tried ‘best guacamole recipe in the world’. This resulted in 275,000 hits. Not having sixteen years up my sleeve I scanned a larger than normally acceptable number of websites to dig out the best raw version I could find. That means, anything with cheese, yoghurt, sour cream, meat, corn chips, tequila(!!) was immediately noted but sadly ignored. I looked at recipes from everything including vegan and raw food websites, to celebrity chefs, universities, Mexican government and avocado specialist websites. I finally whittled the results down to the top five. And I noted that to add a twist, you can add anything from pomegranate seeds to cayenne pepper, jalapeño chillis, diced cucumber, celery, cracked pepper, white pepper, red onion, spring onion, parsley and even capers. You can watch the clever desperate housewife use lemon juice instead of lime and a larger proportion of avos. It’s a lovely fresh flavour and annoyingly, not bad at all. The avocado experts follow an authentic basic recipe, adding cumin for extra flavour. Their recipe is very authentic and follows the basic recipe. The difference is that they add water and lots of chilli and blend everything to a paste first. This recipe is apparently courtesy of The Culinary Institute of America. Again, it’s the basic recipe and a bit boring. Hence it’s in last place. Blend everything together. Pop it in the fridge for an hour and serve. 1. I serve mine in shot glasses with a fresh raspberry or cherry on top. 2. To spice it up – add chilli flakes, a dash of cayenne pepper and a full cup of cacao. the avocado is a rich and vital source of essential minerals, vitamins and mono unsaturated fats that actually lower your cholesterol level, keep your immune system strong and your skin supple, lower your blood pressure, stimulate your metabolism and improve your liver function. The overall benefits of including avocados in your daily diet are numerous and weight loss is only one of them. Also, if you do happen to be on a diet, the high fat content of a single avocado can make you feel more full, more quickly, and hence, potentially prevent you from eating more than you need. An avocado has one of the highest contents of B6 in any known food, which we need to keep our blood, teeth, gums and nervous systems in top notch condition. With three times as much B6 as a banana, which is widely promoted as the ‘good mood’ food, perhaps we should call the avocado the ‘best-ever mood’ food. It is also very high in Potassium, essential for keeping blood pressure in check. In fact, in 1987, the results of a two year study run jointly by the Schools of Medicine of the University of California San Diego and Cambridge University in England, showed a 40% reduction in stroke risk following an increase in daily consumption of 400mg of Potassium, equal to about half an avocado. Avocados are also rich in fibre, another important factor in keeping our digestive systems happy and our weight under control. And because, unlike many other vegetables high in nutrients, we eat avocados raw, all those lovely vital nutrients enter our systems more efficiently and unaltered from their natural state, ensuring we get maximum benefit.